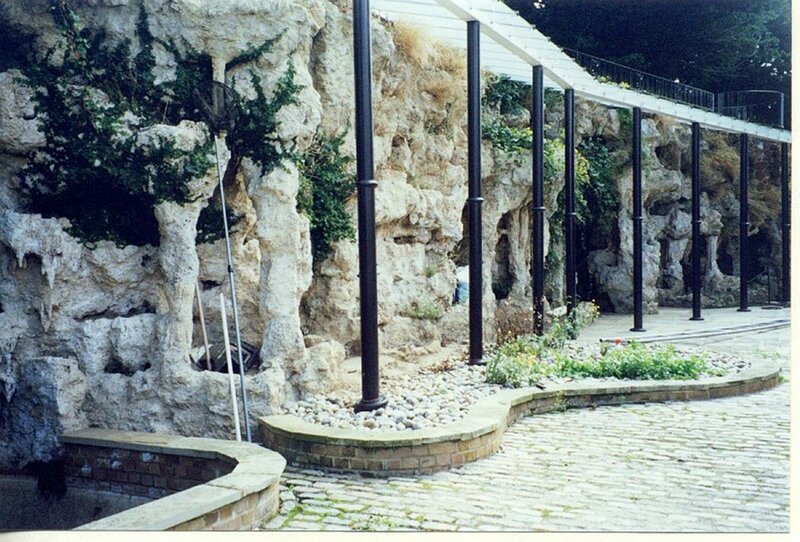 In an Appendix to his booklet, Picturesque Ferneries and Rock Garden Scenery, James 2 lists quite a number of clients for whom the firm built ‘large’ or ‘small’ ferneries, although these were invariably for private clients whose houses no longer exist, or are difficult to trace. Since the booklet was published c1877, it obviously provides no references to any work done after that date. Thanks to some of those invaluable pieces of ‘information received’, it has been possible to identify later Pulham ferneries, some of which – such as the ones at Dewstow, Merrow Grange and Warren House – are described in Rock Landscapes: The Pulham Legacy. This article discusses two more that are well worthy of mention. One is still in excellent condition, and the other is not, but that is not the only comparison that can be made between these ferneries and their owners . . .
‘In 1865 George Palmer (1818-94) and his wife moved into a Victorian sandstone house in Reading. He was an MP, first freeman of the borough and was interested in public education. Since he had associations with the Extension College from which the University of Reading has grown, it is appropriate that the house has become University property. ‘Probably some time in Palmer’s latter years, a series of glazed structures was added to the south exit of his home. 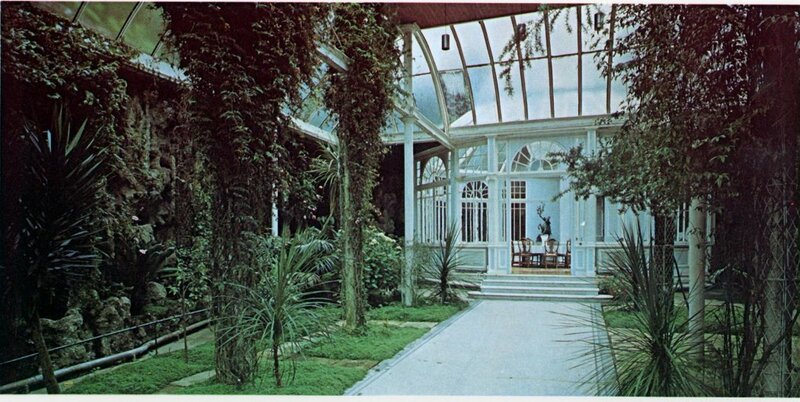 They comprised a large ‘L ‘-shaped fernery, leading via a small circular area into a curved lean-to corridor, and thence to a conservatory block. The last no longer exists, so the corridor, overhung by a huge plane tree, leads directly into the gardens. 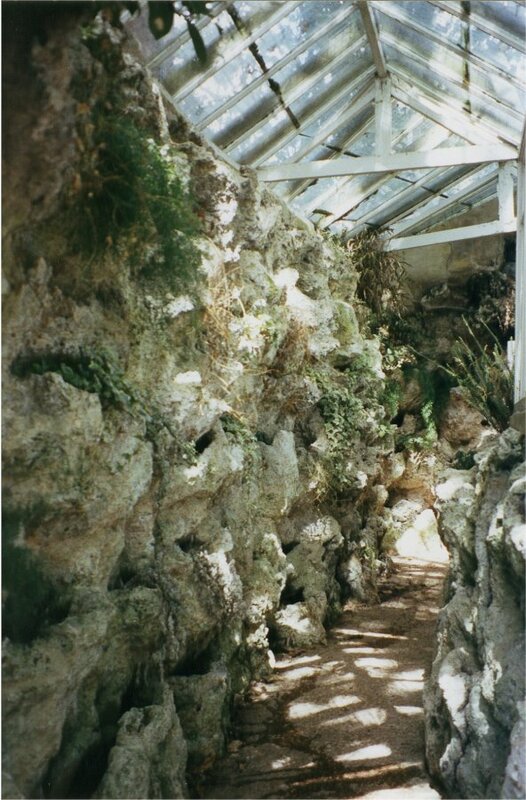 ‘The fernery has vast walls of an artificial tufa-like material made into an impressive complex of cliffs, buttresses, planting pockets, subterranean pools and stalactite-like structures, stuck here and there with larger pebbles at the back to give the impression of the wall being a different material. The house is heated in winter and, being extremely humid, the surfaces are covered with mosses and liverworts beneath a tapestry of ferns and Begonia rex. In the circular area, water passes beneath a concrete bridge and a gap in the stonework forms a skylight hung with trails of Ficus pumila, whilst the wall side of the corridor is lined from floor to ceiling, about 2.4m, with the same material modelled into numerous small plant pockets. The half-glazed side, opposite, has a lower but otherwise similar arrangement. They do indeed. Everything about the structure of the fernery bears the stamp of a Pulham craftsman – the careful stratification of the rockwork; the planter pockets and the water system are all so absolutely typical of their work – as is even the entrance door! From the outside, it looks just like any other entrance door, and it gives no clue to the surprises that lurk beyond. 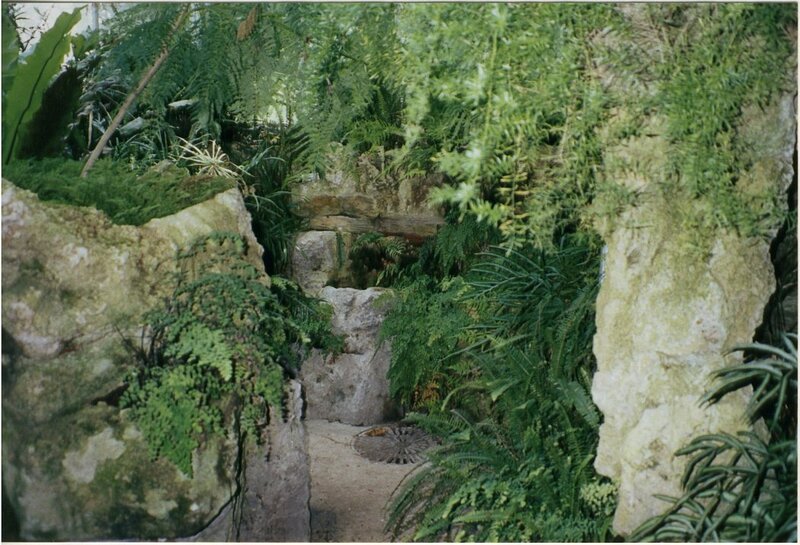 Just open it, though, and one can walk straight through into the dramatic fernery corridor shown in Fig 1. Continue through here, and through another door at the far end, and one comes to the central circular area at the corner of the ‘L’-shape structure, as described by Sally Festing. Two pictures of the central island feature are reproduced in Figs 2 and 3, and the fact that it is still in a remarkable state of preservation is all thanks to George Palmer’s foresight, and to his obvious interest in education, because, as the time of my visit in 2001, the site was only used by the University’s botanic students in the furtherance of their studies. 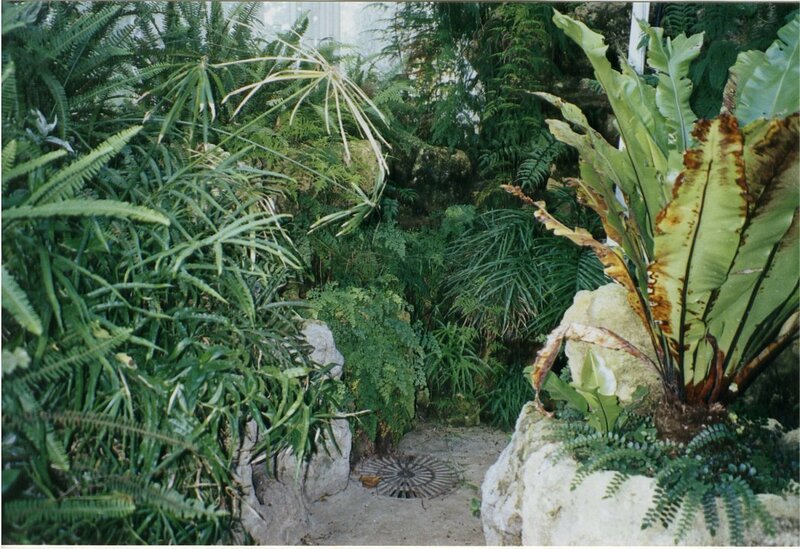 It is not known exactly when George engaged James 2 to construct his fernery at ‘The Acacias’. If must have been later than 1877, because, otherwise, it would have been included in James’ list of ‘satisfied clients’ in his promotional booklet. George Palmer died in 1897, so, on the basis that the work was done quite late in his life, 1891 is suggested as a possible date. It could just as easily have been 1887, however – the very same year in which Pulhams constructed the fernery at Juniper Hill, discussed below. So who was George Palmer? Sally Festing reports that he was an MP; first freeman of the borough, and had associations with the Extension College from which the University of Reading has grown, but that is only part of the story. During the course of my own research into George Palmer and Theodore Bryant – the other Pulham client discussed in this article – a number of fascinating comparisons emerged, but the time to deal with those is after – rather than before – I move on to Juniper Hill. . . This entry makes it clear that Mr Bryant must have been a very satisfied patron, although it was too superficial to attract much of my attention until, one day, I received an e-mail from someone who told me he had just acquired a country mansion in Mickleham, Surrey. It was called Juniper Hill, where he had inherited a Pulhamite structure, and wondered if I might be able to assist him in his reconstruction project. This stimulated my interest, and, as can be seen from the accompanying pictures and notes, it was a very worthwhile exercise. Luckily, the new owner had already done some extensive research of his own that got me off to a good start. Theodore Bryant bought Juniper Hill in 1885, and proceeded to make a number of major changes to it. The most significant was the re-orientation of the main entrance to the house, which had previously been in the centre of the front, facing the garden. He built a new entrance on the rear, northern side, thus involving the creation of a circular drive leading up from the entrance of the old driveway from near the church. He then extended the hall towards what was previously the back of the house, incorporating one of the back reception rooms and modifying the staircase. He retained the beautiful Adam-style ceilings, dominated by the stained glass windows over the stairway, and so created a magnificent new Main Hall as large as a ballroom. The original front entrance thus became the route to the gardens. 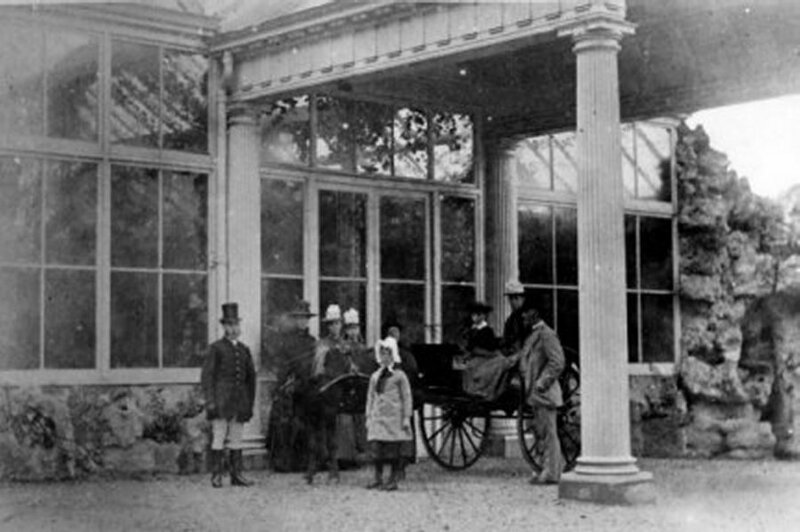 He then built a superb octagonal sunroom beyond the front door that led into a glass-covered winter garden, on the front of which was a porte-cochère – or porch that was large enough to enable Theodore and his guests to alight from their coach, and proceed on foot between the ferns that lined the pathway through the winter garden to the steps leading through to the Sunroom, and thence to the front door beyond – and they never got wet! The Bryant family obviously liked it, because there are a number of old photographs that enable one to follow their progress. Fig 16.4 shows Mr Bryant and his family arriving at the front porch, along the front of which one can glimpse some familiar-looking Pulhamite stonework running along under the windows, and forming a ‘cliff’ wall on the right. This is obviously the work of the Rock Builders from Broxbourne. 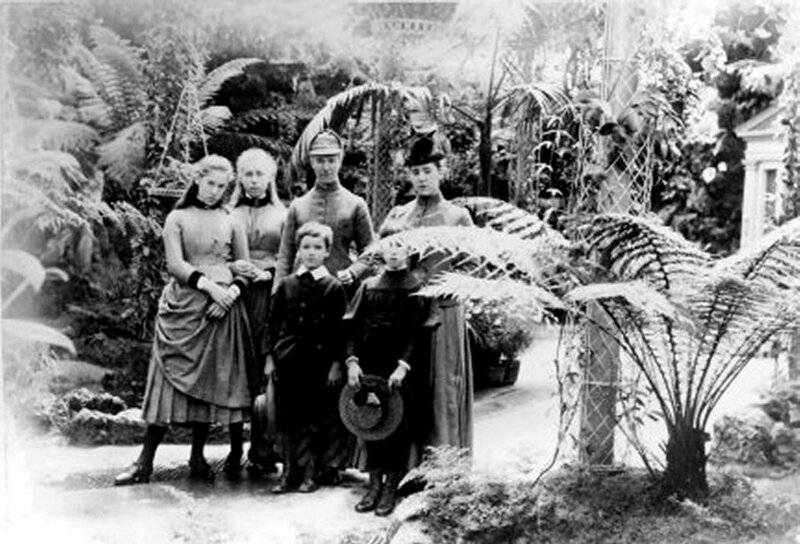 The Bryants continued to live at Juniper Hill until 1899, when Theodore sold the property to Leonard Daneham Cunliffe, of the merchant banking family. Today, the house is much the same as it was, although only a skeleton of the Winter Garden now remains. Not all is bad news, however. The frontage containing the porte-cochère has gone, but there are still a few remnants of some Pulham work to the left of where this used to be. 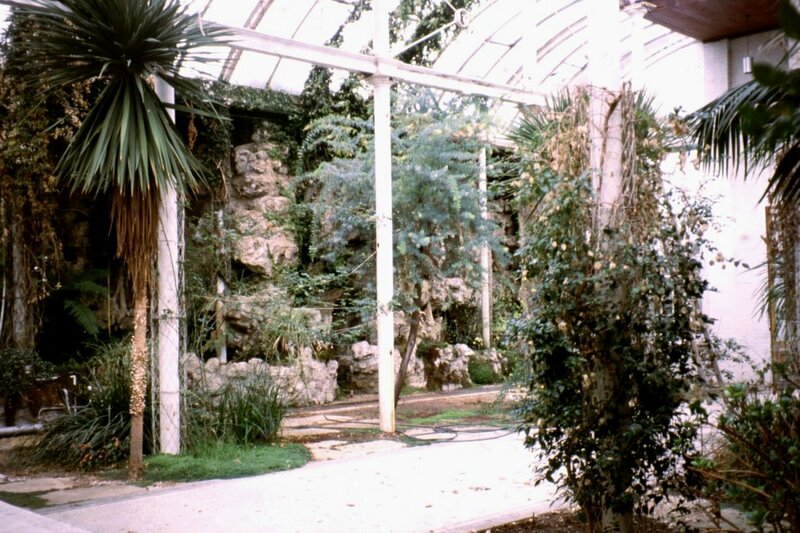 Fig 7 is a picture of the Winter Garden as it was in 1993 – still managing to survive roughly as it was 100 years previously – but this had nearly all disappeared by the time of my visit in 2001, due to safety considerations. 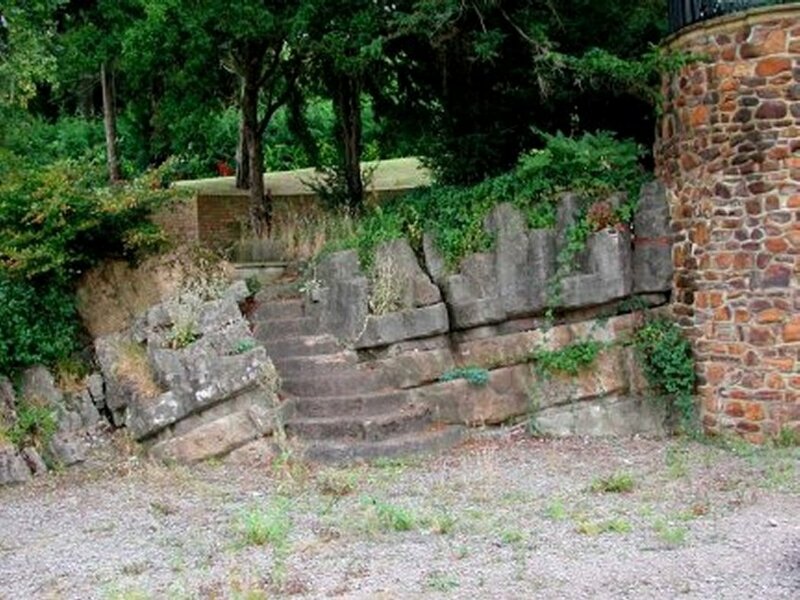 I did find some rusticated steps leading up to the top gardens, however, as can be seen in Fig 8. Figs 9 and 10 show that the front and roof of the Winter Garden was removed, and only the tufa-covered walls on either side of what is now the courtyard remained. There was still sufficient there for it to be instantly recognisable as Pulhamite, however, although the structure on the right-hand side, nearer the house, has since also had to be removed – again for safety reasons. This is pictured in Fig 10 – taken from the pathway above the left-hand awning. This is certainly a significant piece of our Pulham heritage, and, considering its age, and what it must have gone through over its lifetime, what is left of it is still in fair condition. One must be thankful that its present owner is determined to do whatever he can to restore what remains to something like its original grandeur. As noted earlier, my research into these two ferneries revealed some fascinating comparisons between the lives, personalities and reputations of their owners, George Palmer (1818-97) and Theodore Bryant (1843-1913). Although they have nothing to do with James Pulham or Victorian rock gardens, it may be of interest to remark on some of them here. Both men came from Quaker families originally based in the West Country. At the age of 14, George Palmer was apprenticed to his uncle in Taunton to learn the trade of confectioner and miller, and moved to Reading in 1846 to join his younger brother, who was apprenticed to Joseph Huntley Jnr, an ironmonger. Huntley’s father – also Joseph – owned a baker’s shop in London Street, Reading, from which he operated a small but thriving business in which one of his sons, Thomas, was a partner. Joseph Snr retired in 1838, leaving a vacancy for a new partner, and, in June 1841, Thomas invited George Palmer to fill the vacancy. The firm of Huntley & Palmer was born, and, within a few years, employed a team of salaried sales representatives to sell their cakes and biscuits to retailers all over the country. The business continued to expand, and moved into a new factory in 1846, but Thomas Huntley was not fully committed to the business, so George bought him out and brought in his own younger brothers, Samuel and William, to help run the business. They kept the name of Huntley & Palmer, and all the partners became very wealthy. Their range of novelty biscuit tins are now regarded as valuable antiques. Francis May retired to his farm in Reigate in 1868, and William Bryant brought his four sons into the business as partners. Arthur, the second son, died in 1884, but, by the time William died in 1885, the three remaining brothers had become extremely rich, and they all decided to move out into the country. Theodore bought Juniper Hill in 1885, and proceeded to extend the house and gardens as described above – a much more ostentatious approach than that taken by George Palmer. George Palmer enjoyed a very happy association with his workers. He held a Factory Suppers for them every April, and they soon became a well-anticipated annual event. The 1850 supper was brought forward to February, however, so that all employees, together with their wives and sweethearts, could get together to celebrate George’s marriage to Elizabeth Meteyard. George’s partner, Thomas Huntley, died in March 1857, but Thomas’s son, Henry, showed no interest in the business, so George Palmer bought him out, and brought his own brothers, Samuel and William, into the business as full partners. The business kept its name of Huntley and Palmers and continued to go from strength to strength. They began to employ unmarried women in the factory – it was not until the mid-twentieth century that married women were also employed – and, by the 1870s, all female workers were given an afternoon cup of tea ‘to help them work more effectively.’ It is not known whether their refreshments also included cakes and Huntley and Palmer’s biscuits . . .
A new factory was built in 1846 to enable workers to work in a much more spacious and light environment, and they were also able to adapt their skills as more and more of their work became mechanised. In fact, they had the distinction of working on the first continuously running biscuit machinery in the world – all invented by George Palmer. Working hours were still long, however, and it was not until 1872 that the hours for men were reduced to the same as for women – 54 hours per week – but that was quite usual in those days. In fact, Huntley & Palmers enjoyed the reputation of being the largest, and most noteworthy employers in Reading, which was often referred to as ‘the Biscuit Town’ – in fact, the Reading football players were also known as ‘The Biscuit Men’. Workers were given a 40-minute break for breakfast – their normal starting time was 6.30 a.m. – and one hour for lunch. They were also given regular days off – Good Friday, Whit Monday, three or four days for Christmas, and half-days for local events such as the Henley Regatta and the local Agricultural Shows. These holidays were unpaid until 1873, when workers were awarded payment for their Christmas day holiday. The firm was very conscious of its image in the town. Men and women were required to enter and leave the factory by separate routes and at different times, and they also worked in separate rooms. A set of rules and regulations was also established ‘for the purpose of preserving good order,’ and the firm also followed the common practice in those days of imposing a scale of fines for poor conduct, such as swearing, striking anyone, damaging or neglecting machines. These misdemeanours cost a one-shilling (5 pence) fine, while being absent without leave, smoking, or bringing alcohol on to the premises cost 6d (2.5p), and working with unwashed hands or face cost 2p. This regime was not as Draconian as it may at first seem to us, however, because, in this company, these fines were all paid into the Staff Sick Fund – a compulsory scheme to which all employees were required to contribute 6d per week – in order to benefit employees or their families who had experienced a death or serious illness. All employees were required to be medically examined to qualify for this scheme. They also received a weekly bonus of a pound of broken biscuits. . .
‘We desire to convey to each Member of the Service the assurance of our sincere and respectful sympathy in the sorrow brought home to you by the death of the Founder and Senior Partner of your House, the late Mr George Palmer. So what about the workers at the Bryant and May factory? What sort of lives did they lead, and how did they compare with the lives of George Palmer’s employees? It is sad to say that their lot was somewhat different to that of their masters – and to their contemporaries who were fortunate enough to live in Reading! Bryant and May were initially regarded as enlightened employers with a model factory in Bow, East London, but it appears that they failed to change with the times, and attracted more and more publicity for the dangerous working conditions and poor pay endured by their employees. Annie Besant, a famous feminist and fighter of social causes, first became aware of these conditions in June 1888 – a few months after James 2 completed the construction of the Juniper Hill fernery – when she attended a meeting of the Fabian Society in London. Clementina Black gave a speech on ‘Female Labour’, in which she referred to the working conditions at Bow, and Annie Besant was so horrified that she visited the factory the next day, and interviewed some of the people who worked there. She discovered that the women factory workers had to work ten or more hours a day to earn 8 shillings per week (40p in today’s money) – i.e., nearly 8% less than the equivalent Huntley & Palmers workers were earning 27 years previously – while piece workers could only earn 4 shillings, or 20p. Due to a similar system of fines imposed by the Management, however, they were lucky to get even that. Sums ranging from three pence to one shilling were deducted for offences that included talking, dropping matches, or even going to the toilet without permission! If they arrived for work a few minutes late, they would lose a half-day’s pay. ‘”We don’t want no holidays,” said one of the girls pathetically, for, needless to say, the poorer employees of such a firm lose their wages when a holiday is “given.” So furious were the girls at this cruel plundering, that many went to the unveiling of the statue with stones and bricks in their pockets, and I was conscious of a wish that some of those bricks had made an impression on Mr Bryant’s conscience. Annie Besant also discovered that the health of the women had been severely affected by the phosphorous from which the matches were made. They were made to carry boxes on their heads until their hair rubbed off, and their skin turned yellow – a condition that eventually developed into ‘phossy jaw,’ a form of bone cancer that led to a horrible death. Despite the fact that the use of phosphorous was banned in Sweden and the USA, the British government refused to follow their example on the grounds that it would be a restraint of free trade. In the same month, June 1888, Annie Besant wrote another article entitled ‘White Slavery in London’ for her newspaper, The Link, in which she complained about the way the women workers of Bryant and May were treated. The company reacted by trying to force their workers to sign a statement declaring that they were happy with their working conditions. When a group of women refused to do so, their organisers were sacked, and the response was immediate. Several other campaigners for social justice took up their cause – including Catherine Booth, of the Salvation Army – and the women at the factory decided to form a Matchgirls’ Union, with Annie Besant as their leader. 1,400 of the women went on strike – which some insensitive souls might suggest was probably the most appropriate thing for a matchgirl to do . . . This was the first strike by unorganised workers to gain national publicity, and, after three weeks, the company announced that it was willing to re-employ the dismissed women, and also offered to end their system of fines. As far as is known, there was no suggestion that the women would be offered an afternoon cup of tea ‘to help them work more effectively,’ or that they would be invited to bring their husbands or sweethearts along to an annual dinner. They probably weren’t even given a weekly box of matches – let alone a pound packet of broken biscuits – to supplement their weekly wages . . . 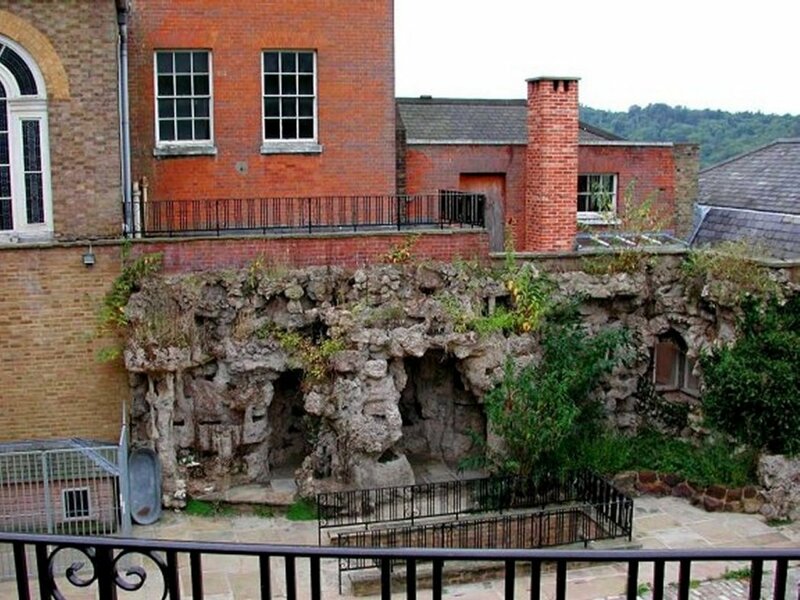 So, if the personal modesty of the owner of the small fernery at ‘The Acacias’ in Reading went hand-in-hand with his generosity of spirit, public service and philanthropy, what does this tell us about the personality of James 2’s Client in the grand house on Juniper Hill? Posted on June 4, 2014 June 4, 2016 by Claude HitchingPosted in Sites Month 2Tagged 'Juniper Hill' Mickleham, 'The Acacias' Reading, . . James Pulham and Son, Annie Besant, Bryant and May, fernery, George Palmer, Huntley and Palmer, Theodore Bryant. it was my Great grandfather, Claude, my grandfather would have still been at school!!!! !